Rep. Seth Moulton is thinking about making a run for the White House. 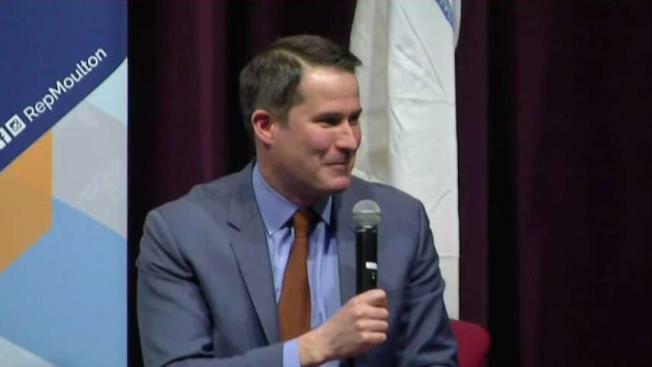 Rep. Seth Moulton is weighing a 2020 run for president. Matt Corridoni, Moulton's communications director, confirmed to NBC10 Boston that the two-term Massachusetts Democratic congressman "is thinking about" joining the race to be his party's presidential nominee. A rising political star who recently saw a backlash for criticizing U.S. Rep. Nancy Pelosi assuming the role of House Speaker and may face primary challengers himself, Moulton first told BuzzFeed News he was considering running for the nation's highest office. "I think it would be valuable to have a commander-in-chief who's had to make life-or-death decisions before," Moulton told BuzzFeed News, referring to his experience as a former Marine Corps officer, later adding, "and I think we need leaders who are focused on the future. Who are respectful of the past but are ready to turn the page, and chart a bright new course for this country." Moulton has already visited New Hampshire, Massachusetts' neighbor to the north, which hosts the first 2020 presidential primary. His most recent visit was earlier this month. If he does launch a campaign, he'll be joining a crowded Democratic field that already includes another Massachusetts lawmaker. U.S. Sen. Elizabeth Warren officially kicked off her presidential primary campaign over the weekend in Lawrence.